PNW District Optimist Clubs: One, two, three ... GROW! One, two, three ... GROW! March is the month for recruiting new members, or so I have been told, and in honor of this special time of year, Optimist International has created a very useful reward. In fact, this reward is so useful, it will double as promotional tool for your Optimist Club. Is your sign old and worn? Does it have an outdated logo? Perhaps your community has never had one? Now is the time to take action! Optimist International promises to send you a brand new sign if you add ten new members to your club's roster between March 1 and May 30, 2012. 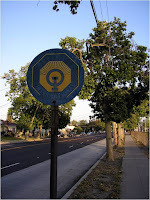 A new road sign will help you get the word out to your community that it is being served with optimism. But first, you'll need to use your fantastic word of mouth marketing approaches to encourage new members to join your Optimist Club! Barry Knoblich, Membership Co-chair for the Twin Falls Optimist Club says it is important to have a membership chairperson and that chairperson must have a plan. The objective of the plan is simply the number of new members that you want to add to your club. Since you will historically lose 20% of your club's membership to attrition every year, your goal must include that number. The key elements of the plan are to make it fun for everyone to participate, help them understand what they are selling, and to reward them when they are successful. Goals should be strategic and attainable. A good example of both is to ask every member to sponsor one new member every year. This emphasizes the importance of volunteers to the success of the club's projects and ongoing mission. It also helps decrease burnout. Extra hands bring needed help and the bonus is veteran members become friends with the new members they recruit. Your product, or what you are selling, must be easy to understand. First and foremost, belonging to an Optimist Club allows the potential new member to provide service, in coordination with other like-minded people, for their community. Because you are working with others, there is the built-in camaraderie; however, through participation in meetings and projects, real fellowship develops. Finally, working in the community provides an opportunity for personal growth, sometimes career-wise and sometimes in one's own self-awareness. 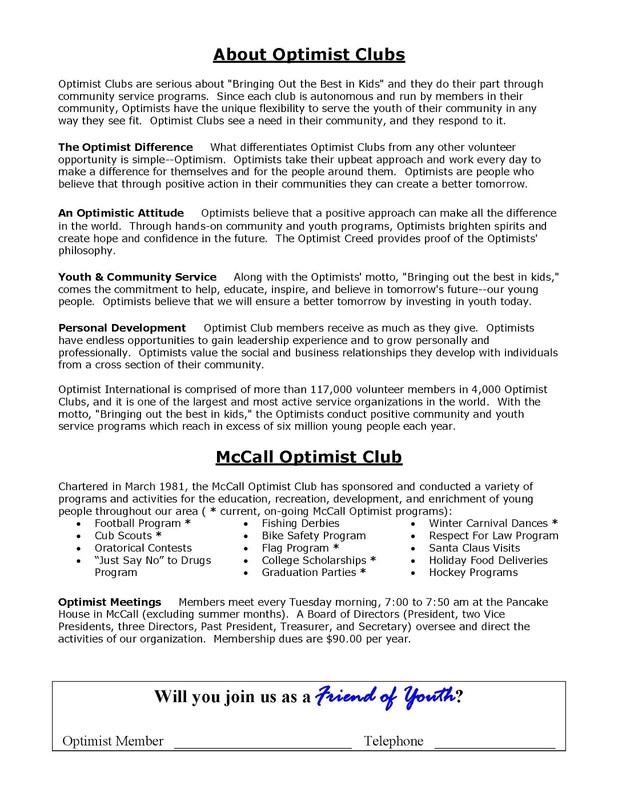 The product of Optimist membership, in a vibrant Optimist Club, provides all three. The reward for sponsoring new members should reflect the culture or personality of the club. In Twin Falls, they recognize individuals weekly for bringing guests and have an annual celebration where the losers (those who didn't sponsor new members) serve the winners (those who sponsored new members). Last year, the party also doubled as an orientation for 50+ new members who joined the Twin Falls Optimist Club last year. Finally, Barry explained that everything you do must be enjoyable or as interesting as possible. Why? Because you are competing for time with members' work obligations and family time. It's up to your club to make it worth your members' time. Have interesting speakers. Often clubs will treat their meetings like committee meetings and discuss only business or plan for the next event. While that might be necessary on occasion, a steady diet of planning is boring. Most important, it doesn't allow the club to learn what is happening in their community. Speakers share needs, ideas and successes, and they take what they have learned about your Optimist Club back to their own organization or describe their visit when they make presentations at other clubs. Seek out grants. Often, clubs become discouraged when they are turned down, but instead, they should take the information gained from the rejection and learn to ask better. He also encouraged connecting with the community foundation in your state for dedicated grant-seeking and grant-making opportunities. 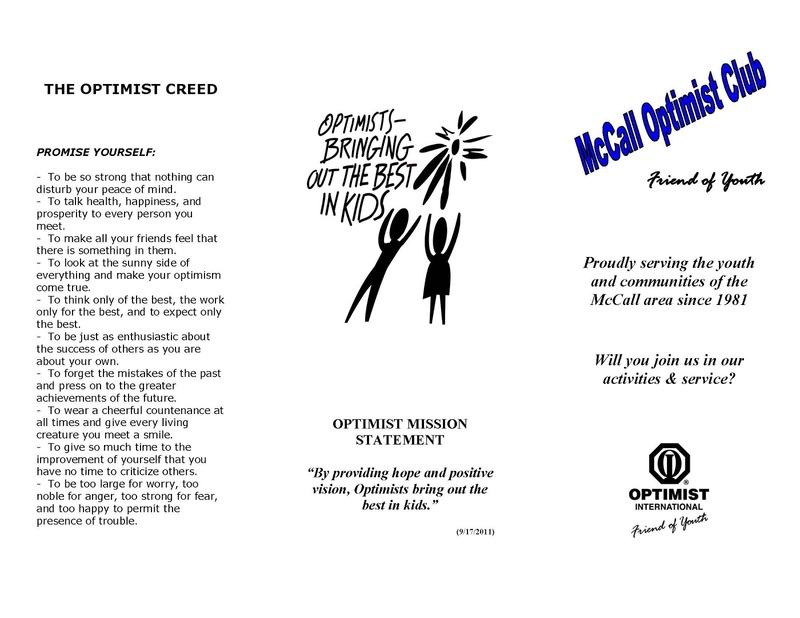 Create a brochure that describes your Optimist Club's projects and mission. The brochure serves several purposes. 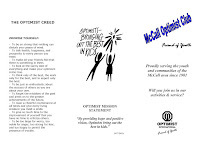 In addition to being easy to hand-out, it also helps the Optimist Club member recall all of the great things that she is able to do because she is a member of the club and reinforces her commitment to the cause. Click here to download the brochure sample in a Word format. Thanks to Jim Thackeray for the example. 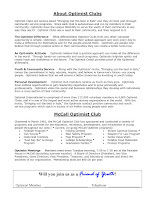 You have the drive and the reasons to bring new members to your Optimist Club and now you have the tools. We know you can do it! One, two, three...GROW!